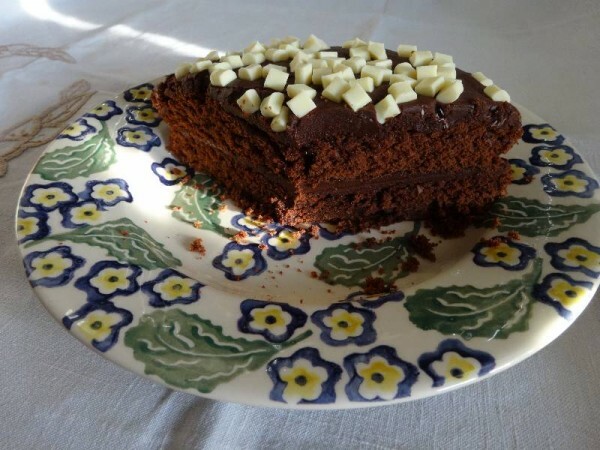 For many years I have used a recipe for chocolate cake that I found in Jane Cable-Alexander’s book Giving a Children’s Party (Pelham Books, 1980). During that time I’ve changed the ingredients quite a bit, cutting out the salt entirely, substituting butter for margarine, using 3 eggs instead of 2 and, having experimented with different flours, I decided that, instead of the recipe’s 200g SR, the best result comes from using a combination of 100g SR flour, 50g wholemeal flour and 50g ground almonds. The one thing I have never changed is the 5 tablespoons of evaporated milk which gives the cake its milk chocolate flavour and perhaps helps to keep it moist. Neither have I tampered with the accompanying recipe for chocolate fudge icing (which also calls for evaporated milk) because it is just perfect as it is and incredibly easy to make. 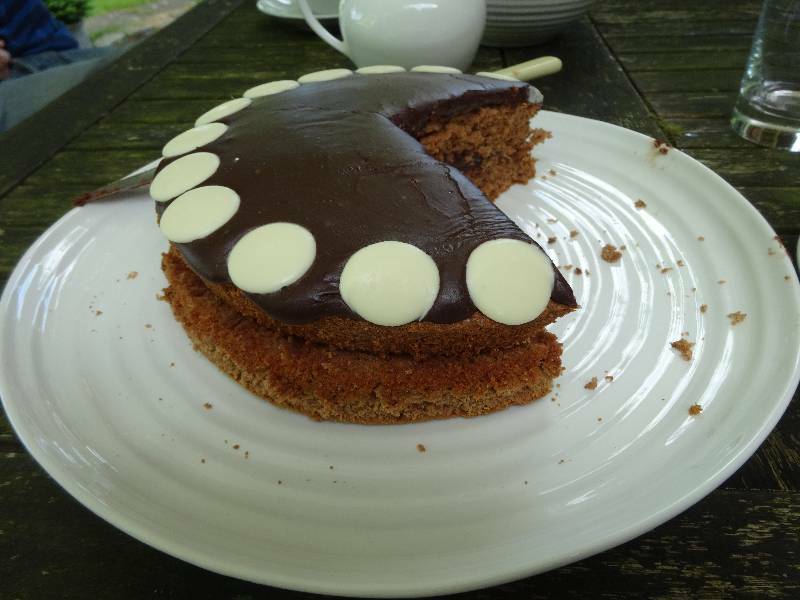 The resulting cake is excellent, soft, yet firm enough to allow you to pack the cake into a tin and take on a picnic. It also keeps very well in a tight lidded tin – if anyone in the house will leave it unmolested. 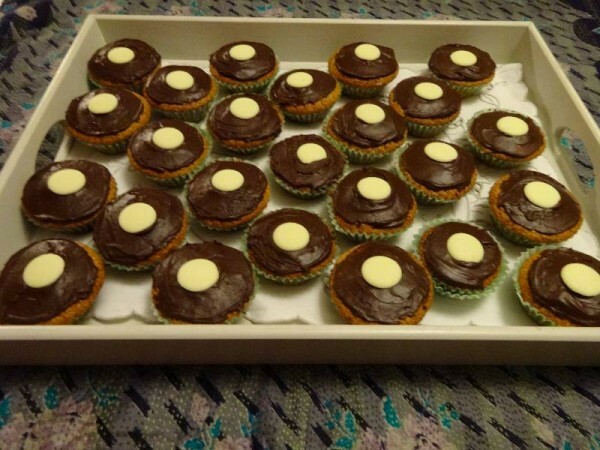 Little cup cakes made from this recipe have also been well received by students coming to the library’s ‘Squash biscuits…and chocolate cake’ afternoon breaks. 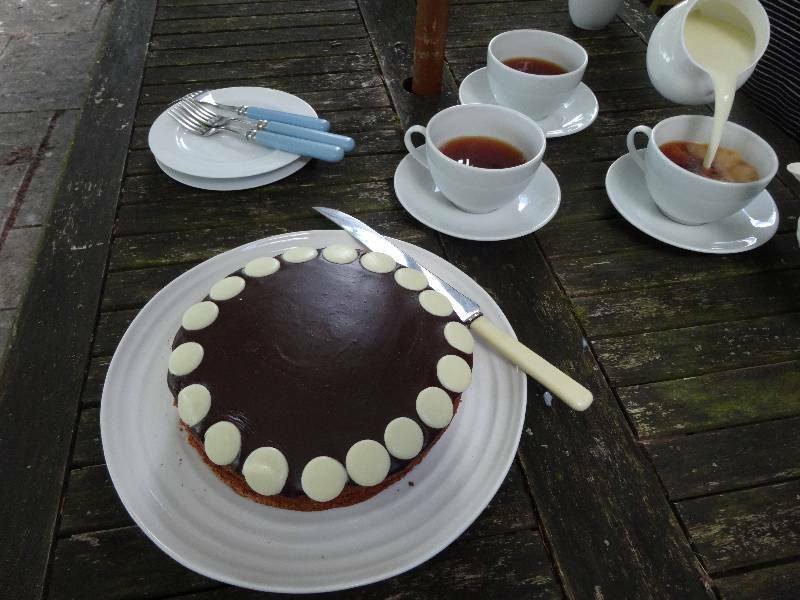 And what a good thing that has been for, instead of trying new recipes I could just churn this one out on semi automatic pilot – necessary when fitting cake making into an evening after work (and icing until after Newsnight). The Ovaltine cake was a variant on this recipe. Grease 2 deepish 18 cm/ 7 inch, either round or square but not loose-bottomed tins. Line with greaseproof paper unless you have the sort of cake tins that have a metal arm that whizzes round the tin and loosens the cooked cake, in which case just grease the tins but you don’t need to bother lining them. Sift the dry ingredients and rub in the butter. Mix together eggs, milk, water and vanilla extract and add to the mixture. Beat this well until it is soft. Pour into the baking tins. Bake in a moderate oven at 180 degrees C/ 160 degrees C for a fan oven/ 350 degrees F or Gas Mark 4 for about 30 minutes. The cake should be springy when pressed with a finger (or when a skewer comes out clean). Melt the butter and the cocoa together and then stir in the icing sugar, evaporated milk and vanilla extract. Remove from heat and beat like billy-o until smooth. Do not panic if it looks lumpy with far too much icing sugar showing as white globules in the chocolate sauce – just keep beating. Suddenly you will feel the mixture stiffen and go fudge-like. Spread immediately as it will firm up quite quickly – but don’t worry, this is an advantage as you can get it right to the edge of the cake without fear of it dripping over the side. (Dip a knife into boiling water if you feel you need to help the icing spread more smoothly.) Set chocolate buttons on the edge immediately. This sounds horrific and far too stressful but actually amazingly easy. After a comment from Katia Jade who was mystified as to what drinking chocolate was and whether she could buy it in the US, I began to think that perhaps drinking chocolate was not necessary and that ordinary cocoa was better. I then made the cake shown below with cocoa and it was delicious. I was a bit heavy handed on the cocoa, so if you want more of a lighter chocolate cake, make sure you only add 1-2 tablespoons of cocoa powder to the cake mix. The chocolate fudge icing remains the same. I refer you to my reply to Katia Jade if you have problems finding drinking chocolate. Now she’s made me think, I’ve come to the conclusion cocoa would probably be better. Hope all goes well if you make it, it is pretty foolproof. Greetings! I’ve been following your blog since I was led here by a link from Jane Brocket’s yarnstorm. I would like to try this cake, but a brief search left me a bit confused about what an American could use as “drinking chocolate”. I gather it differs from the powdered hot cocoa mixes we have. Most of the definitions I’ve seen, however, describe drinking chocolate as being based on melted bar chocolate. Any advice for your American fans, or should we order something online? And if so, could you recommend a brand, so we could search for it? Thanks so much! Drinking chocolate is cocoa + fine sugar ready mixed and in the UK Cadbury’s Drinking Chocolate is probably the brand that first comes to mind (and Cadbury is now owned by a US company). Some very expensive upmarket chocolate drinks, like Charbonnel and Walker’s are just pure grated chocolate and this might do too but using this would mean you would be adding more fat and unnecessary expense. But, gosh, now I think about it, I don’t think the recipe really needs drinking chocolate. A couple of tablespoons of cocoa powder should be fine and might even be better – there’s plenty of sugar in the recipe as it is. (But definitely, I think, avoid chocolate milk powder). Hope evaporated milk isn’t a problem – even here it’s a bit of an old fashioned store cupboard standby – but it does give the cake a lovely richness. Thank you for following my blog – it was wonderful to have Jane put a link from yarnstorm. Best of luck and let me know how it goes if you make the cake. Thanks so much! I’ll try it soon! This looks like a great recipe. I love using evaporated milk, it gives such a distinctive flavour, and moisture. I notice one of your other comments is from someone who found your blog via Jane Brocket’s blog, as did I! Recipe just as good with cocoa instead of drinking chocolate – though it needs a careful hand with the cocoa to maintain the milk chocolate flavour as a little goes a long way. Jane Brocket sent quite a lot of people my way – it was very generous of her to mention my blog and I am really grateful for having gained more readers. It’s fun wondering what Barbara Pym’s character s would have made of home made biscuits and cake in church. 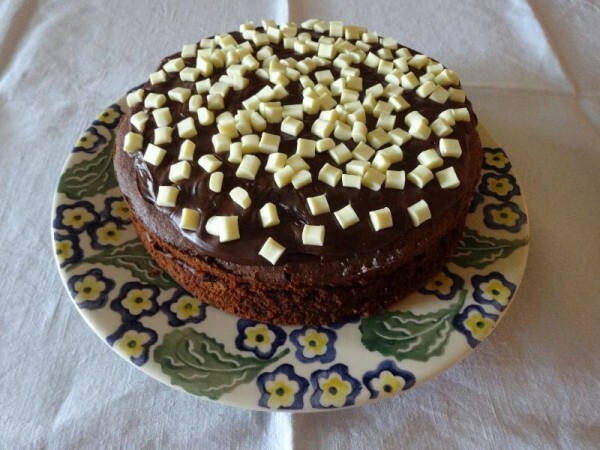 Did you make the chocolate cake using the recipe on the blog? Yes, I did make the cake following the recipe on your website and was pleased when it turned out to look like yours. I shall certainly be using the recipe again. I think that, if the parish ladies in Barbara Pym were to get invoved in providing cake for church, they might get very competitive, trying to impress the curates they have crushes on. In Some Tame Gazelle there is a reference to Fuller’s walnut cake, which is something I remember. Oh, I’m so pleased to know the cake recipe was successful. I think there’s a future blog post on cakes/clothes/vicars and Barbara Pym. Did you know her sister wrote a cookery book with recipes (but no pictures) of dishes used in the books (The Barbara Pym Cookbook by Hilary Pym and Honor Wyatt). I remember when there was a Fuller’s on Cornmarket in Oxford and I also remember the walnut cake too.! I think that Pym is often making a rather Woolfish point about women and food. Some of the food mentioned in her novels might not be terribly welcome in a cookery book. I am thinking of baked beans with cigarette ash, and a casserole of hearts. (The latter always reminds me of the cold heart regularly served by my Berkshire grammar school, which perfectly illustrated the phrase as tough as old boots). Yes, Rosemary, I think you’re right, the food is usually mentioned for another purpose, perhaps to indicate class or social status, appetites other than for food or just for comic effect. According to Ellen M. Tsagaris in ‘The Subversion of Romance in the novels of Barbara Pym’ (1988) in the US there is/was a perfume called ‘Paperback’ which is billed as smelling like a dusty old copy of a Barbara Pymn novel. I feel the food might have a similar aura. I am the author of The Subversion of Romance in the Novels of Barbara Pym. Thanks for referring to my book, but I actually published it in 1998, not 1988. Also, I never wrote about a perfume called “paperback. I like your blog very much; here is a link to one of mine. Ellen, sorry to have misattributed to you the quote about the perfume ‘Paperback’. Also apologies for an incorrect publication date for your book. I now realise the quote was by the perfume’s designer. Thank you for correcting me. Thank you too for letting me know that you enjoy my blog – it is much appreciated. I have been unable to get the link to one of your blogs to work, so will do a search instead.